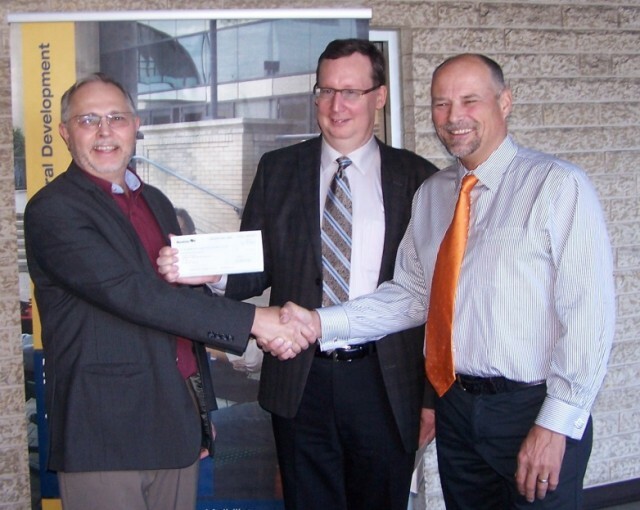 Drew Caldwell, Member of the Legislative Assembly for Brandon East, presents a $110,000 cheque on behalf of Manitoba Agriculture, Food and Rural Development (MAFRD) to Brandon University to support the Rural Development Institute. On behalf of the President, Dr. Poff, Dr. Strang holds the cheque as Dr. Ashton, Director of RDI, thanks Drew. This is part of the five- year funding agreement with MAFRD signed in 2012. Drew Caldwell recognized the importance of RDI in rural issues and policy matters.